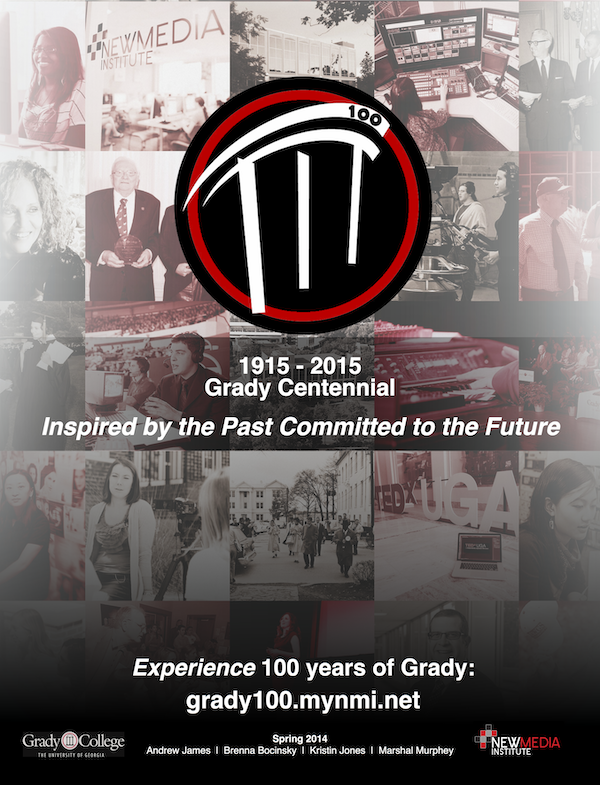 Grady 100 will honor Grady College’s past while demonstrating Grady’s remarkable pursuit of the technologies that will define the future of journalism and mass communication. We aim to inspire and influence Grady alumni, current and prospective students to donate to the College. Our approach to promoting Grady consists of three main segments: an interactive history of Grady, a map of Grady alumni’s current locations and an appeal for donations to Grady. Our interactive history will tell Grady’s story using parallax scrolling, a technology that generates differential scrolling times for the various elements of a webpage, creating an illusory sense of depth and, therefore, a greater amount of reader immersion. Readers will be inspired and enthralled as the faces and stories of Grady’s past and present are paired with parallax scrolling interactivity and immersion. We will use our storytelling segment to remind Grady alumni of Grady’s greatness, inform current Grady students about their school’s past and attract prospective students to the idea of attending a century-old, world-renown college like no other. Capstone Grady’s alumni map will allow Grady alumni around the world to locate and contact their peers via a “mash up” of LinkedIn and Google Maps. In addition to uniquely illustrating Grady’s reach in respected organizations around the world, our alumni map will enable Grady alumni to potentially find employment opportunities and nominate fellow alumni for Grady alumni awards. The final section of our website will be a simple appeal to readers to donate to Grady using UGA’s donation website. We believe that readers, after witnessing a powerful telling of Grady’s incredible century of learning and innovation, will be more than willing to help ensure that Grady’s greatness lasts for many centuries to come.